Does it strike you as odd that God is always comparing Himself with fire? His eyes blaze like fire (Rev. 19:12). The Book of Hebrews tells us that our God is a consuming fire (Heb. 12:29). Jeremiah 20:9 says His Word is like a fire. He showed up in the fire with the three Hebrew boys (Dan. 3:25). He was as a pillar of fire to keep His people warm in the wilderness (Exod. 13:21). On Mount Sinai He shows up in the form of a burning bush (Exod. 3:2). He said He would baptize us with fire (Matt. 3:11; Luke 3:16). In Acts chapter 2 tongues of fire fell upon the heads of Jesus’s disciples (v. 3). So I would venture to say that apart from the fires of hell, fire is a good thing. 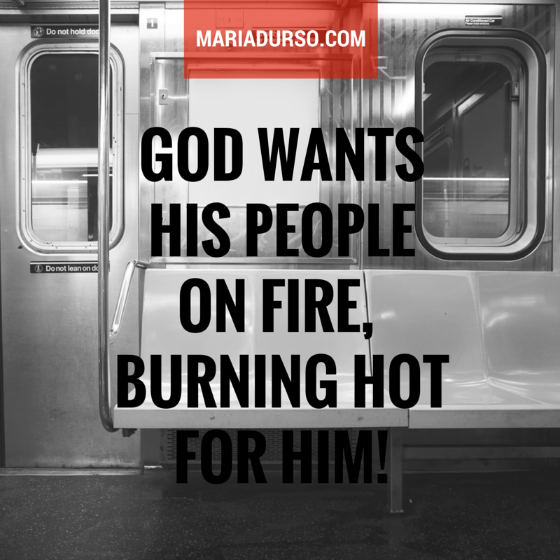 God wants His people on fire, burning hot for Him! These are the two trademarks of every born-again believer: the Holy Spirit, which symbolizes power, and the fire, which symbolizes our passion to use the power. I was changed by His power. Because of the indwelling of the Holy Spirit, my life was transformed from the inside out. I was one way one day, and then after my experience with Christ I was totally different. Why do you think God would use the symbol of fire throughout Scripture, as we just discussed? Well, there are certain properties of fire that I believe God wants to be evident in our everyday lives. Let’s take a look at 3 of them. 1. Fire illuminates—it lights our pathway. It is so important to live in the light of God’s presence so He can expose every dark trap the enemy might place before us. Also, vision is imparted in the fire. When we are looking at the one whose eyes are like fire, we will be able to receive revelation for our own lives as we are led and directed by the Holy Spirit. People on fire hear the still, small voice within saying, “This is the way, walk ye in it” (Isa. 30:21, kjv). Fire changes the property of even the most hardened surface. It changes our hardened hearts. Life naturally makes us hard. We are not naturally pliable, moldable, or even stretchable. We are naturally fearful, small minded, stingy, and petty—at least that’s what I am without the fire of God. When we soak in the boiling oil of God’s presence that has been heated by the fire of God, He changes what and who we are. Consider this: Paul was a tentmaker. The only way a tentmaker could get the most bang for his buck was to take the hard hide of an animal and boil it in hot oil. When he removed the hard hide from the oil, the hide was stretchable, and the tentmaker was able to do so much more with it. It covered much more territory with less effort. But without the hot oil, the tentmaker could have pulled and pulled all he wanted but to no avail. The hide simply had no give. The hide of the animal is so much like our hearts. No matter how hard we try or grit our teeth, our hearts aren’t going to change—unless we get in the line of fire, in the direct heat of God’s presence. The fact of the matter is, those ancient tents had to be taken down and soaked in boiling oil on a regular basis because the elements of nature, like the rain or the sun beating down on them, caused shrinkage. They had to be reboiled, re-stretched, and remolded. Life happens to us, but while the heat of life shrinks our heart’s capacity, the heat of the fire of God enlarges our capacity. Just a little soaking in God’s presence makes all the difference in our world and in those whom our lives affect. 3. Fire is contagious—it burns everything in its pathway. Fire is not particular. It doesn’t say, “I’ll burn down the couch but not the table.” Of course not! It burns everything in its way. When fire touches something, there is no mistaking it. There is an indistinguishable smell after a fire. God has created us to be spiritually combustible, spiritual pyromaniacs—human torches somehow affecting everyone in our path. We are to be a sweet smelling aroma to God. People on fire leave a distinctive scent behind. When you are truly on fire, you don’t hide behind religious walls. You are not particular about the type of person you reach out to—the color of their skin or their economic background. When you are on fire, you are not intimidated by external matters. Without realizing it, you touch everything around you with your presence in some way, shape, or form. Remember this: God doesn’t only judge faithfulness, but He also judges temperature! In the Book of Revelation there were two churches with temperature problems. One was the Laodicean church. The members were neither hot nor cold but lukewarm (Rev. 3:14–22). The other was the Ephesian church (Rev. 2:1–7). They left their first love; they lost their passion. Brothers and sisters, we need to be “packin’ holy heat”—no concealed weapons. I saw you today in Joni’s and I loved your testimony. God is so good!! Glory to Him!!!! Thanks so much for this exposition, I am really blessed and edified by it. God bless you really good and continually increase you strife to edify the body of Christ with His gift of the word over your life.